75yo presents with right knee pain gradually worsening over past year. Also complains of pain and stiffness around finger joints particularly in the morning. 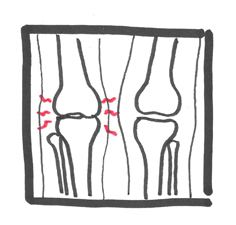 Overview Once arthritis is suspected, physicians should distinguish between noninflammatory and inflammatory forms of arthritis while recognizing potentially disabling and life-threatening problems.